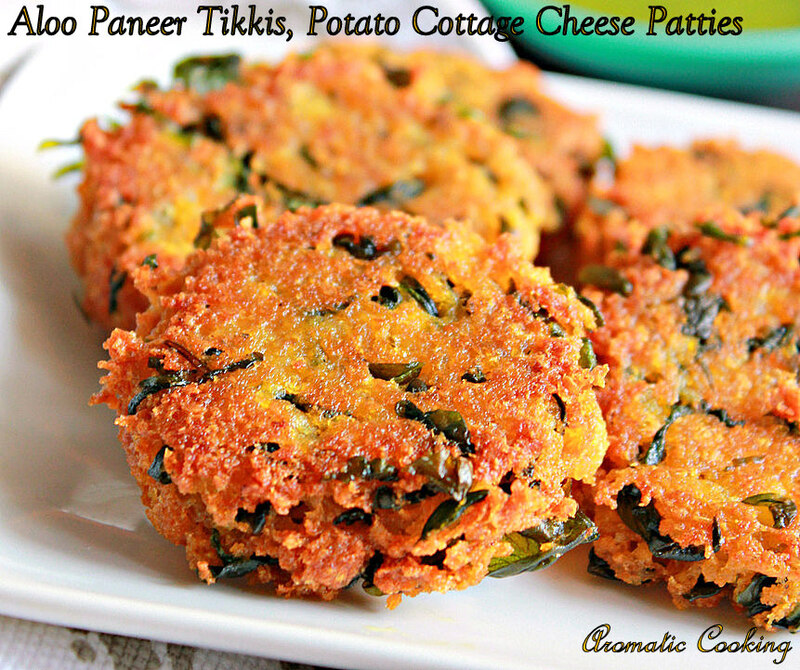 I had some paneer left after doing the usual Palak Paneer, it was a small quantity and not enough to make a dish with it alone, so I decided to add some potatoes with it and make these Aloo Paneer Tikkis, Potato Cottage Cheese Patties. I have also added some fresh methi ( fenugreek ) leaves to add some flavor to the tikkis. Tikkis can either be deep fried or shallow fried, I have shallow fried these tikkis. 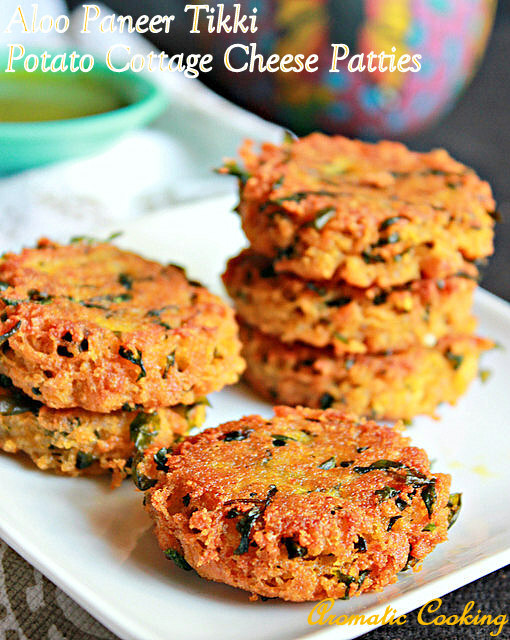 They turned out super delicious, crispy on the outside and soft on the inside, and tasted great with coriander chutney, you can also serve them with some tomato sauce too..
Wash and chop the fenugreek leaves and keep. Heat some oil, reduce the heat completely, add the turmeric and red chilly powders, immediately followed by the ginger and saute for a few seconds. Then add the fenugreek leaves and saute for 5 minutes till it loses all the moisture. Take the grated potato and paneer and add the methi leaves, salt and garam masala and mix. Roll out small balls from the potato-paneer mixture and flatten them slightly as shown in the picture. Heat some oil for shallow frying, place the flattened tikkis and fry them till they turn golden brown, then flip them gently and cook the other side and remove. Drain the excess oil. If after mixing the potato and paneer, if the mixture is still very wet, then add a little corn flour and mix. If you are deep frying the tikkis, then dip them in a thin batter made with all purpose flour/ maida and roll them in bread crumbs and then do, otherwise the patties might break when you drop them into the oil. You can also add some grated garlic along with the ginger and add some finely chopped green chilly to make it spicy. Absolutely delicious looking patties!! It is so crisp and nice!! They look so crisp and delicious! They look really crispy and flavorful.